Dole Gudbrandsdal (also known as Dolahest or Dole) horses originated in the Gudbrandsdal Valley near the North Sea coast of Norway. It is likely that the Friesian played a part in the breeding of the Dole. The Friesians traded heavily with Britain, Norway, and the Rhine Delta during the period from 400 to 800 A.D. The Dole horse of today is found in two types: a heavy work horse and a light draft horse (the cold-blooded trotter). The difference between the two types has been greatly reduced in recent years due to interbreeding between the types. This interbreeding is now becoming very common and the breed is becoming very uniform. The heavy type of Dole horses are tested for pulling power and trotting when presented for grading. X-rays of the knee and lower leg are taken in lighter trotting type, and animals with defects are disqualified for breeding. Stallions of this must have achieved satisfactory results on the track before being used as a stud. Three year olds may be issued a temporary stallion license if their conformation, breeding and trotting ability are acceptable. The quality of Dole horses have improved during the last several years due to the organized selection of breeding stock. 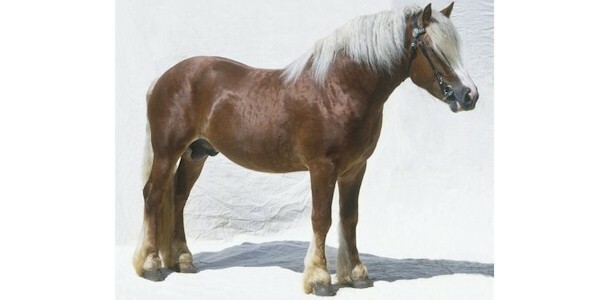 Bay or brown are the predominate colors of the Dole horses but black and chestnut are also fairly common. There are a few grays and duns. Some have white markings on their head and legs, especially among animals of the trotter type. Dole horses are one of the smallest cold bloods. They have an excellent trot and great pulling power. They are agile and active and show great stamina.